Have you noticed that more people are including “please retweet” in Twitter messages? This is interesting because in certain circles it’s considered bad Twetiquette (boorish) to request a retweet. A retweet is akin to forwarding an email. If you receive a message you like so much you want to pass it on to your followers, just do a retweet, or RT. This one earns a double RT. The message links to a terrific resource for search rank marketing information. Many of my followers are into SEO, so it gets an RT. Quotes/words of wisdom comprise a good deal of Twitter traffic. I like the sentiment in this message and think my followers will, too. This news item caught my eye and it provides entrée for a little humor. I like to give followers a chuckle now and again. About the recent rise in people asking to be retweeted — I have an idea why it’s happening. Earlier this week Fast Company posted an article titled Report: Nine Scientifically Proven Ways to Get Retweeted On Twitter. It gave a sneak peek of a paper by Dan Zarrella, a noted marketing scientist and web developer who’s into scrutinizing all things Twitter. Zarrella then posts the full report, The Science of Retweets, on his blog. Hmmm, sounds a lot like the tipping point. Retweets have implications beyond the idea that those who get RTed are flattered to receive a virtual stamp of approval. They’re word-of-mouth marketing. They play a role in politics, as happened when talk about death panels and the health care debate got RTed around the twitosphere. Those two letters pack a lot of heat. OK, so what’s the secret to getting an RT? Messages containing links are three times more likely to be RTed than those without. It’s good to be first out of the gate; novelty/newness accounts for many RTs. Punctuation is preferred, and top RT getters include a colon, period, or an exclamation point. Negativity and potty-talk are out — religion, work, money and celebrities are in. The highest daily volume of RTs occurs on Friday. 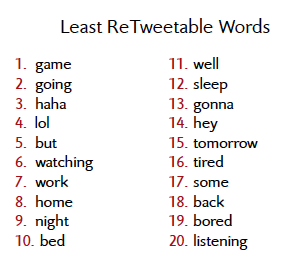 Take another look at most RT-able words and phrases and then take a gander the title of this post. See why it is how it is? Will you please retweet this great new blog post? What do YOU think of the science of retweets? Comments welcome. I’m just getting started on Twitter, and just recently started to understand the RT phenominon. I’d agree that it is slightly bad twitterquette to request a RT. The content should stand for itself. I am personally neutral on this one. Asking neither offends me or does it make me more inclined to do an RT. As you say, ultimately it’s the content that makes the decision. At least a person has asked in a good way but, twitter is fast getting to be a marketers dream land. Many of the tweets are rubbish, a pitty really as it is such a good concept.